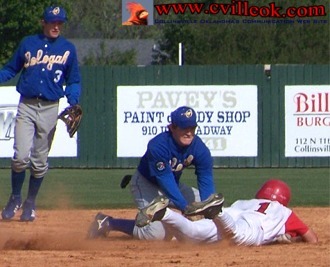 Shawn Curtis (#1) doubled in the 4th inning but was thrown out on the next play. 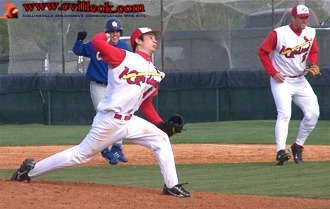 The Cards trailed 1-3. 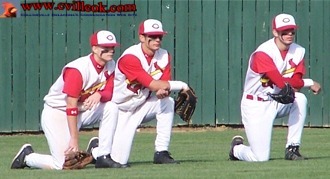 The Collinsville outfielders (Curtis, Nair & Thurman) took a break during one of the pitching changes in the 6th inning. 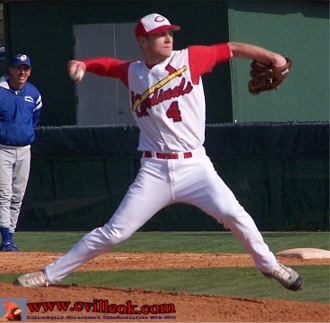 Kevin Phillips (#4) pitched the first 5 innings. Oologah started the 6th with a solo homer for a 1-4 lead. Before the Cards got to bat in the 6th they were down 1-8 and had made two pitching changes. Jeremy Guest gave up one of the runs and D.J. Neighbors (who came in with no outs and the bases loaded) gave up 3 more. 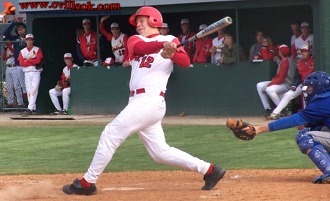 Garrett Tole (#12) took a big swing on this 6th inning Oologah pitch. The Cards scored 4 runs in the 6th on a Garrett Thurman single, Kyle Keith walk, Shawn Curtis walk, Tyler Nair single, Riley Murr single and a David Chester single. D.J. 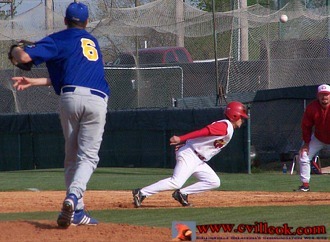 Neighbors (#6) closed out the final three inning as the Cardinals tightened the score to 6-9. 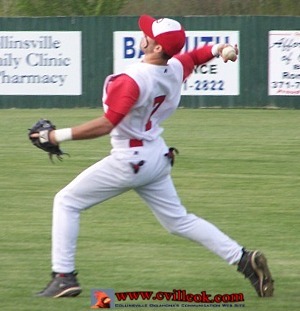 Garrett Thurman (#7) gets the ball back to the infield in Oologah's half of the 7th when the score reached 5-9. 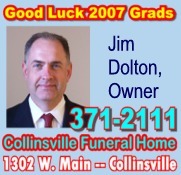 Collinsville managed 1 more run in the 7th with a Shawn Curtis single followed by a Tyler Nair double.